There is a difference between a house and a home. A house is a work of construction, defined by the bricks and stone out of which it is made. A home, on the other hand, is a place of solace, where the mind finds peace. It should have the power to draw you into its bosom in good times and bad. 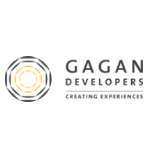 We at Gagan Developers understand how important it is to create a home out of a house. That’s because our homes are built on the strong foundation of a fourteen year old legacy that amalgamates vision with trust. Our expertise lies in our ability to merge high technology with efficient design at affordable prices. Gagan homes are designed for today’s urban family that wants the best of everything. We do not stop at that. With the vast range of amenities on offer, you will soon be a part of the new age lifestyle. Nestled within a soothing, welcoming environment that is the perfect antidote to the high-octane hours you spend at work, your home becomes the ideal spot to relax and chill out with family, friends and loved ones. Trust is born out of strong values. That is the legacy we have inherited. Gagan brings you the sky. We promise nothing less.